whether New Orleans, Serbian, Bulgarian, Hungarian, Romanian, Albanian, Macedonian, Greek, Turkish, Gypsy, Jewish or Japanese. Its various innovators have taken the martial music of the governing regime, absorbed from the everyday soundscape, and reworked it into distinctive, artistically insubordinate folk traditions. A potent array of new and archival brass-band recordings so testifies—frenetically, deliriously, farcically, tragically. 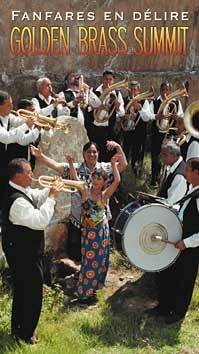 Throughout the Balkans, an enduring legacy of Ottoman military occupation is indigenized brass band music. In the former Yugoslavia, the House of Culture in Guca, Serbia, inaugurated the annual Dragacevo brass festival in 1961. After Tito's death and Yugoslavia's dissolution, the archive suffered the effects of a decade of war, until musicologist Ilija Stankovic returned from exile to rehabilitate what he could. The result is Network Medien's sweeping two-volume Fanfares en Délire: Golden Brass Summit, which offers 42 evocative tracks spanning four decades of competitions for the festival's "Golden Trumpet" award. It serves up searing examples of the trance-inducing kolo dance of western Serbia (Milovan Babic, Raka Kostic, Svetozar Lazovic, Aka Novkovic), and from southern and eastern Serbia, the Roma (Gypsy) cocek dance, which derives from the Turkish "belly dance" tradition. The two genres are hardly mutually exclusive, however. Among the few occupational avenues open to the oppressed Roma population was music, so mastering the genres of other groups brought distinct economic and social advantages. As heard on this collection, Roma musicians like Bakija Bakic, Boban Markovic, Slobodan Salijevik and Ljubisa Stamenkovic perform both kolo and cocek forms. While the trumpet holds center stage, also manifest are superb examples of regional clarinet (Jovica Ajdarevic Orchestra; Nani Ajdinovic Orchestra; Ljubisa Stamenkovic Orchestra; Ferus Mustafov; Budimir Ilic), flute (Milica Stosic's ethereal solo, "Petlovi Poje"; Spasoje Jovic; Vladan Baralic), percussion (Ljubisa Stamenkovic's darkly insistent "Djokin Cocek"), violin and accordion (Dusan Radetic's masterly "Gajda") and vocal styles (Paganke; Vica Choir). One only wishes that the notes discussed the individual artists, performances and genres more systematically. In any case, Stankovic's impressionistic overview (in English, German and French) and the superb photographs convey the music's passion and poetic urgency. If music is a universal language, then Fanfares en Délire is a magnificent introduction to the wondrous babel of Serbian brass. Trumpet master Boban Markovic leads off the Fanfares en Délire compilation with four tracks, a measure of his dominance at the Guca festival during the 1990s. His work inspired filmmaker Emir Kusturica to tap Markovic for the soundtracks of his Arizona Dream and Underground, bringing the Balkan sound to many overseas listeners for the first time. Markovic's new Hungarian release, Srce Cigansko, also features trumpeter and Guca award winner Jovica Ajdarevic, Krstic Momcilo (clarinet, saxophone), a mellow quartet of flugelhorns, tuba, spinning drum and bass drum, with guest spots by Lajkó Félix (a possessed violin on "Crni Voz"; if only his work had a higher profile here) and the atmospheric hand percussion of Molnár Gábor (ditto). Markovic's tone on "Momina Igra" recalls the stirring coloration of Miles Davis's Sketches of Spain, but his playing is never derivative. There is a sublime but all too brief clarinet-trumpet tradeoff on "Svekrvino Kolo"; Momcilo's clarinet also animates "Momina Igra," "Karamicko Oro" and "Fono Cocek," and he contributes an energetic sax figure on the driving "Igra Cigana." 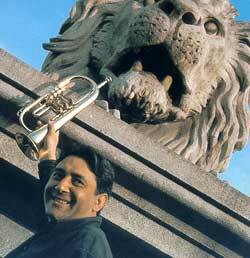 Aspiring trumpeters will have Markovic trained in their sights for many years to come. 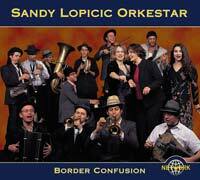 A tragic, abandoned sonority powers the Sandy Lopicic Orkestar, a muscular 15-member multiethnic brass band arisen from the wreckage of the Balkans, also integrating the Klezmer strains of the German band Deishovida. Three soulful female singers front the band, hailing respectively (and improbably, if we are to believe the region's ethnic cleansers) from Bosnia, Serbia and Kosovo. Alas, the album notes do not identify the individual vocal solos; these women can sing with the best. Compare, for instance, the sublime half-whispered Albanian lament "Apo Hapi Syte" (in which the qualities of clarinet and human voice intertwine); the delicate soprano of "Kales Bre Andjo," a Macedonian song of love; the oompah Klezmer chutzpah of "Da Zna Zora," a drunken song of Bosnian passion ("If dawn only knew who I am kissing tonight, it would never break! "); the rock-vocal edge of "U Stambolu Na Bosforu"(a Bosnian-Turkish deathbed call to the dervishes); the polyphonic wail and weave of "Jane Sandanski" and "Ljuba"; the escalating wedding-song passion of "Usti, Usti Babo"; the funky R&B soul of the gypsy anthem, "Djelem, Djelem" ("I Wander, I Wander"). The singers strike a finely calibrated, ever-shifting balance with a virtuoso ensemble, which itself displays a quantum-leaping temperament, as on "Fanfare," "Bugarski Cocek," and the majestic mini-suite "Last I-II." Lopicic commands from the piano and keyboard, backed by a pair of searing trumpets, rootsy trombone and tuba, wailing saxophones and Syrian clarinet (Richard Winkler communes with God), other-worldly violin, resonant hurdy gurdy and button accordion, thumping electric bass, drum kit and live sound. Most tunes are traditional arrangements by Lopicic; hurdy-gurdy whiz Matthias Loibner arranges another and contributes a pair of soulful originals. The repertoire thus reflects Roma, Macedonian, Bulgarian, Romanian, Turkish, Serbian, Kosovar, Albanian, and Russian influences, spiced with the idioms of R&B, funk, rock and jazz. A work of communal musical craftsmanship, Border Confusion evokes the bloodletting madness of the 1990s, but its creative verve and lush sonic tapestry confirm the capacity of the human spirit to rise from the ashes of a murderously compromised regime that engendered unspeakable human brutality, suffering and hypocrisy. Lopicic's erudite, cosmopolitan, freewheeling, non-stop reworking of Balkan brass traditions has a persistent haunting quality. It suggests that music, in its rejection of the politics of death, as an antidote to acoustic and spiritual toxification, in its potential to express sentiments and longings that defy verbalization, has the transcendent power to heal all. Further east, blasting from the gypsy music haven of Moldavia, northeastern Romania, Fanfare Ciocarlia blows away the debris of the surreal Ceaucescu regime with a vertiginous wall of killer sound. The ensemble's twelve members bellow with all the bravura and high velocity one expects of Romany brass-band music: just listen to "Hurichestra"—Betty Boop on speed. Iag Bari (The Big Longing) is their third Piranha release, a delirious, high-spirited mix of Romanian, Serbian, Bulgarian, Macedonian, Turkish, Near Eastern and international strains, all played with grace and humor at a breathtaking pace, and with an ever-finer sense of musical precision. Bucharest's high-profile "Oriental Pop" (muzika orientale) singer-guitarist Dan Armeanca adds his raspy voice and nimble finger-work on three tracks; Bulgarian Voices Angelite inject an eerie vocal presence on "Lume, Lume (World, World)"; and muted-trumpet legend Costel Vasilescu blasts off on two cuts. The Bucharest group Rom Bengale lends a youthful urban edginess on two numbers as well; the lugubrious "Godfather Theme" intro and nimble accordion-violin tradeoff of "Besh o Drom (Keep on Walking)" is worth the price of admission alone. 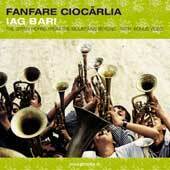 A bonus on this enhanced CD is a zany video clip from their upcoming documentary, Iag Bari-Brass on Fire, by German filmmaker Ralf Marschalleck, to the tune of "Manea Cu Voca," a melancholic vocal performance from their previous album, Baro Biao. 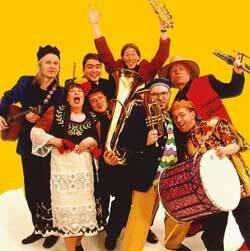 In Germany, the Cologne-based Schäl Sick Brass Band ranges even further afield, annihilating all genres. Tschupun, their first ACT release, throws down the musical gauntlet, moving with versatility from the jokey intro, a Texas-Bavarian waltz figure, directly into "Ghole Pamtschal," a percussive north Iranian folk-dance groove; "Mame Kiya," a Kurdish mother's languid lament for her missing son; and "Tamin Qualbak Ya Habibi," a Nubian dance by Ali Hassan Kubans that could be mistaken for the lost tapes of a punchy New Orleans second line, except for Joachim Gellert's other-worldly melodica—the hovering spirits of the early Stevie Wonder, a la "Fingertips (Pt. 2)"—and some perfect samba percussion. Also not to be missed are "Jodlerin from Teheran/The Lonely Goatherd" (sending up the Richard Rodgers Sound of Music chestnut); the steel drums of a Surinam brass blowout; the swaying reggae-like "Fire Inna Dancehall"; "Westindie," a hypnotic Madrasi brass instrumental; and Iwanka Iwanowa's fiery Bulgarian vocal shadings on a "Malka Moma." And just when you think Schäl Sick is all parody and sculptured flash (they do have a penchant for costume and posture), they strike a cool, stately note with the title track, a Japanese-folk-inspired Iranian shepherd's song, and with the vaporous tones of Lydia Kavina's thereminvox (a zither-sounding synthesizer of Russian origin) solo on the closing hymn-like "Ravina." Schäl Sick's second ACT release, Maza Meze (A Selection of Starters), continues their freewheeling Balkan-Arab-Persian odyssey, returning dividends on their reputation as "Germany's best collective bellows," with a repertoire that remains largely traditional in inspiration. Iwanka Iwanowa moves up from guest to vocal lead, lending her inimitable Bulgarian vibrato throughout. The take-no-prisoners, rap-like melee of the title groove rides atop the horns, channeling the James Brown sound (from the Maceo Parker-Fred Wesley-Pee Wee Ellis school), while the airborne guitar bears the spiritual mark of vintage Santana. "Chawaka" could be a double-timing eastern Macarena; "Bum" masquerades as a Bulgarian samba; "Kasbah" is an instrumental sham-time saunter that could raise the quick and the dead; and the cartoon percussion, kazoo, sax and muted trumpet of "Moderne Zeiten (Modern Times)" conjures up a shambling Chaplinesque comic genius. Schäl Sick's peculiar brilliance is to never forget that theirs is and remains music for dancing. Far to the east, but with its own imperial legacy and musical dialectic, Cicala Mvta might be mistaken for a Klezmer, Balkan or New Orleans brass band landlocked in Japan. The group takes its spiritual inspiration from Soeda Azembo, the legendary Japanese socialist singer-songwriter and jinta interpreter. The jinta genre (a mocking political commentary sung in the streets) derived from popular reworking of the first western tradition imported into Japan, military brass band music. Azembo, "The Mute Cicada," was harassed and imprisoned by the authorities for his outspokenness. As his gravestone inscription reads (in Italian): "Cicala-mvta che cantava e la sva moglie che l' amava (the mute cicada who sang, and his wife who loved him)," hence the band's name. Reinterpreted by artists hired to play circus music, to accompany silent films, or to advertise the opening of new shops with music in the street, the picaresque, soulful style came to be known as chindon. 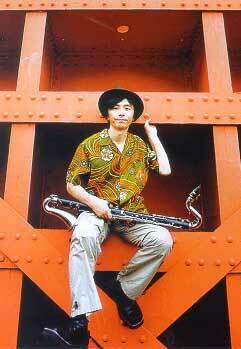 Leader, composer and multi-instrumentalist (clarinet, saxophones, vibes, accordion) Wataru Okhuma founded Cicala Mvta in 1994 to revive chindon. Deko Boko means "convex-concave" or "up-and-down," and the title tune's unusual syncopation sounds like Thelonious Monk on an angular, inside-out Tokyo clarinet jaunt. There are strains of jinta, jazz ("Albert Ayler Melody," "Jelly Roll [Strange] Morton"), Romania ("Kyu-na Saka," "The Blue Flower Kopanitza"), Turkey ("Sukininattle Gomen-nasai"), Klezmer ("Weekend of a Clown," "Bessarabian Hora"), Bela Bartok ("Bulgarian Rhythm") and the purely, slyly experimental ("Dhon Chorecha Variation"). Deko Boko, a startling musical revelation for listeners looking to stretch their aural horizons, testifies to the iconoclastic urge that accompanies every artist hijacking, turning a dominant tradition into a form of social critique and an expression of merry opposition. Remarkably, wherever one encounters popular brass band traditions, they seem to entail a core element of cultural and political defiance, a will to endure in the face of impossibility. In his cinematographic reflection upon the Balkan tragedy, against the magnificent strains of Boban Markovic's golden trumpet, Emir Kusturica's Underground begins, "Once upon a time, there was a country." But rising from the devastation and despair of a politics of ruin, the trumpet's phoenix call pronounces an elusive cultural longing, a rejuvenating, tragicomic music of joy and mourning, transgression and desire, a bittersweet paean to life under the most unimaginable of conditions, in wounded homage to the inextinguishable character of the human spirit. © 2002 RootsWorld. No reproduction of any part of this page or its associated files is permitted without express written permission.